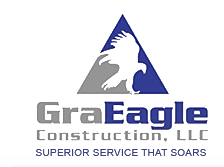 About Us - GraEagle Construction, LLC. GraEagle Construction was established on September 10, 2001 when the principals envisioned a superior construction company that would soar in the insurance repair field. In the beginning, there were only 7 employees inside a very small office. We now have 40 employees in our new office at 5016 Cecile Ave Las Vegas, NV 89115, which includes warehouse space. GraEagle Construction is a Nevada limited liability company comprised of: Jerry P, Director of Operations, Manager and Estimator: Jerry originates from Pittsburgh, Pennsylvania and has been involved in construction since 1980. He previously served as Vice President of Sales for a General Contractor and has been in the insurance repair field since 1993. Prior to that Jerry was in Public Works Projects and the US Army.